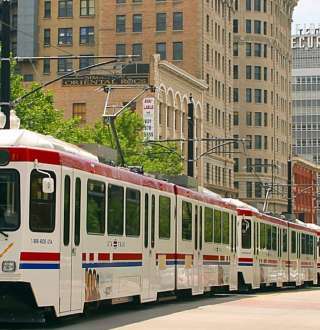 Salt Lake City has a robust public transportation system that utilizes commuter trains, buses, and light-rail to provide you with access from the Airport to the downtown convention district, and all the way up to the ski resorts. Commuter trains, called FrontRunner, provide transportation access from Ogden to Provo, with limited stops along the way. Weekday service starts as early as 4:30 am, with the last stop just after midnight. Saturday service begins at 6 am with the last stop just after 2 am. There is no Sunday service. Light-rail lines, called TRAX, provide access to Downtown from across the valley on three color-coded lines. Downtown Salt Lake provides a great transfer point as all the lines run through the downtown convention district -- also making it easy for you to get anywhere in the Valley if they need to. The Red line provides service from the University of Utah, through downtown, south to 6400 South and then west to the Daybreak community. The Blue line begins at in downtown at the transfer station and runs south through the valley to Draper. The green line begins at the Salt Lake International Airport, runs through downtown Salt Lake and the out to West Valley City. At the airport riders can board at the station and Welcome Center just outside terminal one. Fare is $2.50 and trains run every 15 minutes. Weekday service runs from 5:30 am to 11:30 pm, with a more limited schedule on weekends. The downtown Free Fare Zone is an added benefit that makes day to day getting around during your meeting easy. Available on TRAX light-rail and busses, if you enter and exit within the boundaries of the Free Fare Zone, you ride free.